Born in 1965 in a village in the eastern Jimara district, Barrow completed his secondary education at the Muslim High School in Banjul. He began his career at the meat wholesaler Alhagie Musa & Sons, led by the influential Gambian businessman Momodou Musa Njie, who is also the father-in-law of former President Dawda Jawara who was overthrown by Yahya Jammeh in the 1994 coup. After climbing up the ranks within that group, Barrow did real estate training in the United Kingdom, working at the same time as a bodyguard. Back in The Gambia in 2006, he founded Majum Real Estate, which he now runs. 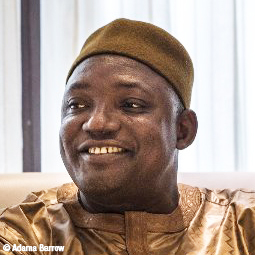 Husband in a polygamous marriage with two women and father of five children, Barrow is a member of the United Democratic Party, the main opposition party to Yahya Jammeh's regime. As a party treasurer, he was nominated on 31 October as the opposition’s candidate to face the outgoing president, who had been in power since 1994. Barrow won the first round of the 1 December 2016 presidential election with 45% of the vote. Following lengthy negotiations and military pressure from ECOWAS, Jammeh was finally forced to step down, which paved the way for a peaceful transition of power. The inauguration ceremony of the new president took place – as scheduled – on 19 January 2017, at the Gambian embassy in Dakar. Despite this difficult start, the new president says that he is determined to achieve “greatness and development” of his country. Indeed, the new president faces many challenges, including rebuilding the country’s political system, restoring human rights, restoring its fragile economy, and reintroducing the country on the international scene. Barrow is the third president of Gambia since Independence.